MCA is always looking for new talents ! Find out the latest news on our blog ! MCA Engineering is part of MCA Group, an international player in engineering and high-tech consulting. MCA’s consultants are engineers commissioned for strategic and technical projects in some of the biggest companies in the industrial and tertiary fields. 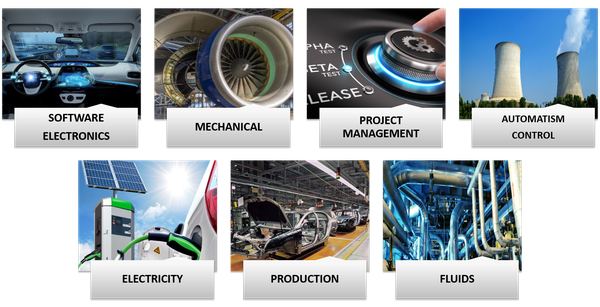 We support our clients with their innovation and R&D issues during the entire product life cycle. More than 1400 engineers work for MCA, offering technical assistance in service centers or under fixed-rate contracts. MCA is committed to diversity and believes in equity and equality for everyone involved in all activities within the company. Self-development and professional growth are both essential for the current and future success of MCA. In order to ensure sustainability, MCA is investing in new areas and activities such as service centers. The main source of investment is MCA’s own profitability. Thus, our financial strength allows us to collaborate with the biggest contractors. MCA is investing in them, consequently generating new opportunities and possibilities for the career development of our employees. Thanks to its rigorous management, MCA is a high-performance company which is investing in major future projects. MCA has completed projects to the highest standards of quality. Extensive assessments are frequently carried out to ensure the improvement and effectiveness of our policies. MCA depends on the excellence and ethics of its teams to make internal and external relationships more transparent. 2013: Creation of 4 subsidiaries in Sweden, Germany, the Netherlands. 2006-2009: New agencies open in France in Aix-en-Provence, Lille, Lyon, Toulouse and Nantes. Creation of MCA Benelux. The volatility of the market and the increase in Energy needs push the players in the sector to innovate and develop new energies. In parallel, numerous Research and Development projects have been launched in recent years to develop new technologies that respect the environment (wind, solar, biomass, etc.). In this context, investments have increased to innovate and meet new environmental requirements. Market players are diversifying in the new energy niche and a synergy with other business sectors (automotive, etc.) is taking place. New challenges in recycling and waste management are emerging. MCA has been referenced by major groups in the energy sector for over 25 years. MCA accompanies its clients on all energy issues and on all phases: preliminary design, design, construction, commissioning, operation and decommissioning. The Group has recognized expertise in conventional energies such as oil, coal, gas and nuclearand is also developing in Thermal and New Energies (wind, solar, biomass...). The international rail context is increasingly competitive with the rise of new players on the market (China, Japan, Korea). To differentiate themselves, players in the sector must invest in new technologies: signalling systems, connectivity, predictive maintenance analyses, data processing to analyse the state of equipment in real time, etc. These major challenges require manufacturers to meet ever more innovative challenges. MCA is referenced by most players in the rail market. The Group provides engineering solutions for each phase of a project, drawing on its expertise in the transport sector. MCA works on the 4 main axes of the sectorinfrastructure, rolling stock, signalling and equipmentand on the entire V cycle of product development. MCA's international dimension enables it to accompany its clients on different markets. The pharmaceutical, medical and biotechnology industries must continually invest to be at the forefront of innovation. The market is in full evolution and is developing around 4 axes: connected health and IOT, industry 4.0, innovative medical equipment and Big Data. 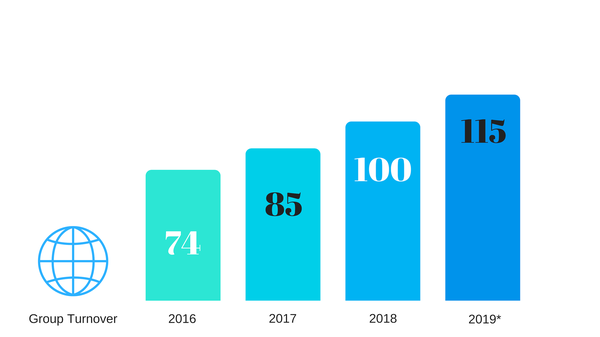 The ageing of the population, diseases and the expiry of numerous patents are pushing these industries to invest in R&D, particularly in Biotech and production. The introduction of artificial intelligence also opens up new perspectives such as patient services. The subject of health implies optimal risk management and very demanding quality processes. Moreover, quality assurance represents the majority of outsourcing needs on the part of market players and is a key issue in the sector. Manufacturers are audited very regularly by organizations around the world and therefore plan heavy investments on quality. MCA, aware of the challenges facing the Life Sciences sector, maintains a strong level of commitment to its clients' projects. 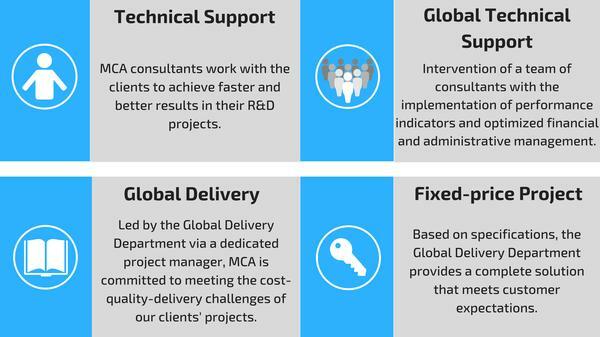 MCA consultants are technical and management experts in complex and sensitive projects. They apply their expertise by carefully monitoring compliance with these major challenges and quality processes. The Group is particularly involved in the development of processes and utilities, as a support during the production phase, but also in the quality part. It supports major players with strategic and operational solutions. In a context of internationalisation of know-how, MCA's geographical presence is an essential asset. Our customers are large Groups in the Process Industries sector (Chemicals, Pharmaceuticals, Cosmetics), which allows MCA to establish its leadership position in these markets. The Group is mainly active in biotechnology but also in pharmaceuticals. MCA participates in the development of new medical devices to facilitate access to care. These major issues force industrial companies to challenge themselves in innovative ways. MCA’s expertise has enabled us to support our clients with their innovations for more than 20 years. MCA has been referenced by the major players in the heavy industry sector. We are able to suggest engineering solutions for each step of the project thanks to our knowledge and competencies in this field. MCA supports the entire life cycle of product development. As an international company, we operate in several markets around the world. New technologies are strategic for all players in banking, insurance and finance. Big data, agility, personal data management and cyber security are at the heart of the sector's challenges. The new players in Fin-Tech are pushing traditional market players to invest and innovate strongly in digital. AXILEO and MCA IT Services, IT subsidiaries of the MCA Group, deploy their offer to the major players in banking, finance and insurance in all sectors of industry. Technological innovation is the driving force behind the development of the multimedia, e-commerce and telecoms sectors. 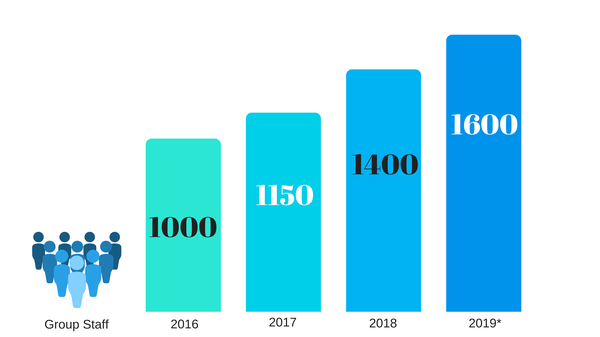 The sector is undergoing profound transformations with a rapid evolution towards the 4.0 industry: robots, connectivity, 3D printing, virtual reality or artificial intelligence. The IOT and connected objects market is exploding: it is estimated that more than 50 billion connected objects will be produced by 2020. In telecom, operators are relying on the cloud and digitalization to improve their efficiency, while preparing for the deployment of 5G. Faced with such changes in lifestyles and the phenomenon of permanent connectivity, manufacturers are also committed to maintaining user data security, which is becoming a real concern. MCA has a team of expert consultants, who listen to customers and users in order to propose ever more innovative and efficient solutions. Joining us means joining a dynamic and welcoming Group. You will have the opportunity to work on technological and challenging projects for prestigious clients. 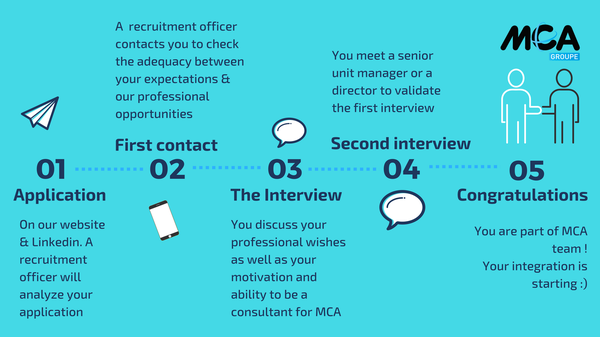 MCA promotes the internal promotion, mobility and professional development of its teams. Our extremely dynamic growth enables us to develop our activities in Europe and abroad, which offers all our teams varied opportunities within the Group. You work into a friendly and stimulating environment! In order to encourage communication between employees, several events are organized. 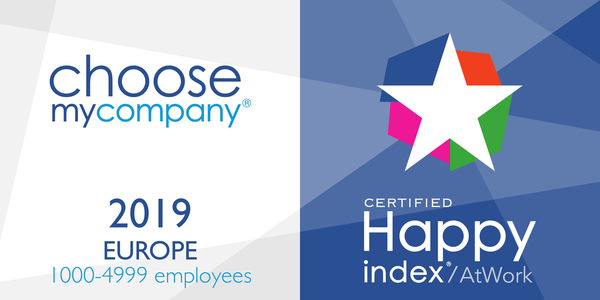 MCA has obtained Happy at Work 2019 certification ! HappyAtWork is the first participatory employer label that rewards excellence in employee management and motivation.